And even though it’s very early in the season, they are frittering away games during a favorable portion of their schedule. Yoan Moncada had three hits and a walk for the White Sox, who stole five bases in the last five innings — several of them uncontested. Chicago won two of three to take consecutive series in the Bronx for the first time since 2002-03. Before last August, the White Sox hadn’t captured a series at Yankee Stadium since 2005. With the Yankees (6-9) missing five dangerous regulars from their lineup, Judge did all he could in this one. He scored on Voit’s double, lined an RBI single and threw out Moncada trying for a two-base hit. New York handed Tanaka (1-1) an early 2-0 lead, but he unraveled in the fourth and fifth as the Yankees lost their fifth in six games. Anderson, who began the day leading the majors with a .444 batting average, drove a fourth-inning splitter the opposite way. 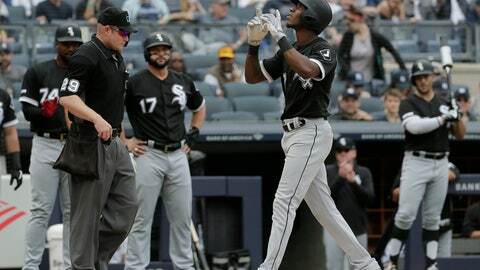 He urged it with a waving hand into the front row of seats just beyond the auxiliary scoreboard in right-center for his third homer and Chicago’s first slam of the season. “It was my first one, so it definitely felt good,” Anderson said. Now that Baltimore’s Chris Davis snapped his record 0-for-54 skid Saturday, White Sox outfielder Daniel Palka has the longest current hitless streak for an active major league position player, according to the Elias Sports Bureau. Palka went 0 for 3 on Sunday, leaving him 0 for 28 this season and 0 for 30 dating to last year. Mikie Mahtook, sent to the minors over the weekend, is hitless in his last 31 at-bats for Detroit. Palka led the White Sox with 27 homers last season, tied for the most among big league rookies.